WITH a name synonymous with tragedy, the Highland Towers site located in Ulu Kelang, Selangor has long been abandoned since a block of the condominium collapsed in December 1993, killing 48 people. It has since become a den for drug addicts and vagabonds. Calls by residents in the surrounding areas to pull down the two remaining 12-storey blocks to eradicate the unhealthy activities going on there have met with inaction, until the newly appointed Housing and Local Government Minister took it up. Within a month after taking office, Zuraida Kamaruddin has expressed her intention to rope in the support of stakeholders to redevelop the site. She deemed the 15-acre site in the Gombak district to be too valuable to be left to decay and become an eyesore. The redevelopment proposal has largely been welcomed by the surrounding residents, but will redevelopment counter the stigma of the ill-fated towers that collapsed due to a landslide? Knight Frank Malaysia executive director for capital markets Allan Sim says the plan to redevelop the area will benefit the local community in terms of stamping out criminal activities that have been found within the abandoned buildings. “It could also help to provide some sort of closure to the families of the affected, which could not have been properly reached over the past 25 years with the ruins of the development still towering over the Taman Hillview area,” he says. A resident who only wants to be known as Marshall, has stayed at Taman Hillview for thirty years and witnessed the rise and fall of this area. He believed that with the government taking the lead in the redevelopment plan, the market’s confidence towards Ulu Kelang properties will be restored. “The abandoned buildings have been an eyesore for local residents. The [Sri Ukay Hillview] Residents’ Association has engaged with local MPs a few years ago and proposed the idea of redevelopment, but nothing concrete has happened. We really hope the minister could realise the plan,” he tells EdgeProp.my. For any development or redevelopment to move ahead, one would need to get rid of the stigma attached to the area as a result of the tragic events due to a landslide. It would be a challenge to rid the thought of similar landslides occurring in the area from people’s minds, says The One Property International Sdn Bhd co-founder and executive director Stephen Yew. The public perception of unsafe soil structure was further aggravated by another landslide incident in 2008 in the eastern side of Bukit Antarabangsa, around 2km away from Highland Towers. “Sentiments have been negative about new developments around this hilly area. Buyers are not so receptive towards the idea of owning a property in an area which is prone to landslide,” he stresses. According to Marshall, despite the tragedy shedding a negative light on Ulu Kelang’s Taman Hillview or Bukit Antarabangsa areas, house price growth in these places have remained resilient although it lags behind the rest of the market. “Prices have continued to climb, especially for houses in guarded communities. The beautiful green living environment and the proximity to KL city centre are the reasons that support the price growth,” says Marshall. Yew of The One Property International notes that the property market in and around Ulu Kelang has proven resilient in view of its strategic position close to Kuala Lumpur city centre and the Ampang area. Sim from Knight Frank concurs that housing prices in the Ulu Kelang area have generally increased over the years albeit slowly. “We believe it is because the Taman Hillview area is home to middle- to high-income earners, coupled with its freehold central location being only 7km to 8km away from KL city centre. In addition, its access to expressways such as the MRR2 is definitely a plus point,” he says. EdgeProp.my data showed that the average transaction price for detached homes in Taman Hillview, which are located nearest to the Highland Towers’ site, have increased to RM261 psf last year based on land size or RM1.31 million per unit based on average absolute price from RM243 psf in 2016 or RM796,667 per unit. No transaction was recorded in 1Q2018. Overall, a total of 31 detached homes were transacted in the entire Ulu Kelang area last year at an average price of RM374 psf or RM1.82 million per unit. As for terraced houses, a total of 57 units were transacted at an average price of RM423 psf or RM790,139 per unit or RM920,000 per unit; one unit was sold at RM271 psf in 1Q2018. As for condominiums in Ulu Kelang, average prices were lower than neighbouring housing areas such as Wangsa Maju and Taman Setiawangsa. A total of 72 condominium units in Ulu Kelang were sold in 2017 at an average price of RM265 psf, compared with RM453 psf in Wangsa Maju and RM396 psf in Taman Setiawangsa. Sim notes that not many development parcels were transacted within the immediate area except for two pieces of land in Ampang Ukay acquired by EcoFirst Consolidated Bhd, back in 2013 and 2015. The company purchased a 62-acre plot from Zurich Insurance (M) Bhd and a 25-acre plot from Harta Villa Sdn Bhd, a subsidiary of IGB Corp Bhd, for RM145 million (about RM54 psf) and RM61.86 million or an average of RM57.45 psf, respectively. The combined 87 acres are currently the project site for EcoFirst’s Ampang Ukay township development. 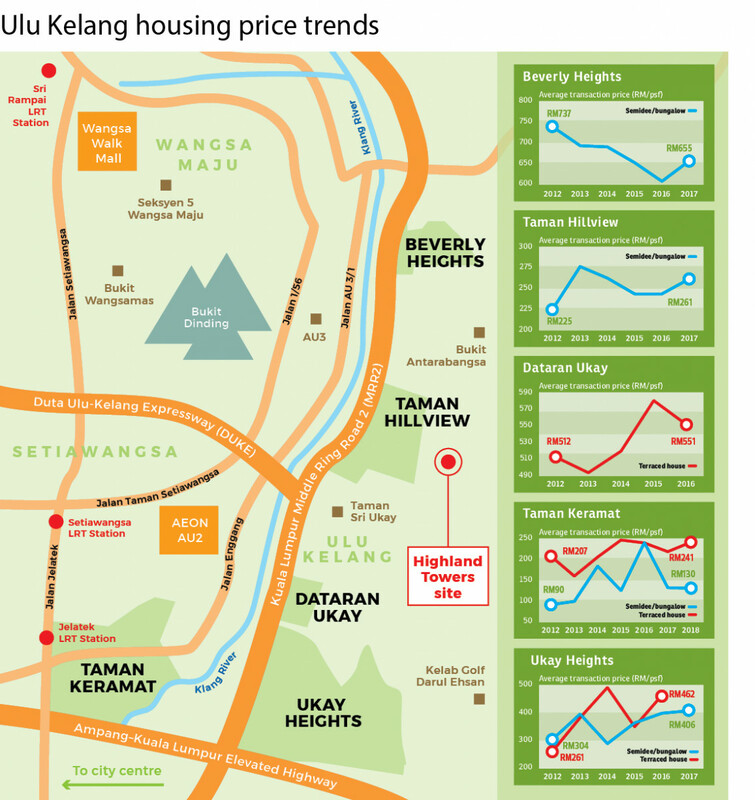 Ampang Jaya area specialist Matt Tian, who is also the head of international market of PropNex Realty (Malaysia), opines that demand in the Ulu Kelang area is pretty stable as most of the houses there attract owner occupiers and not speculators. Despite the stigma of being landslide-prone, Tian emphasises that slope enhancement works have been done over the years and the local community who knows this place well, have treated past incidents as water under the bridge. “This has been reflected in the high rental demand from expats who prefer landed homes with lush green environment. For certain well-maintained and furnished bungalows, expats are willing to pay above RM10,000 rent a month,” he says. However, Tian notes that the rental market has slowed due to cost cutting exercises by the oil and gas industry and multinational companies. Average rent for bungalows has dropped from above RM10,000 a month to slightly below RM10,000. Meanwhile, terraced house rentals have remained within the RM3,500 to RM4,000 range a month, depending on size and condition. Besides the stigma of it being a landslide-prone area, there are many other challenges in redeveloping the Highland Towers’ site, says The One International’s Yew. Among the many issues, land matters pertaining to the ownership of the property and the vested interest of various stakeholders, including banks, will be the first things that have to be sorted out. “With government intervention, there will be a need for a special committee to conduct a feasibility study, take charge of the land and rebuild the entire area with new housing schemes,” he adds. The minister has also raised concerns over land matters as her ministry had encountered some difficulties in identifying the land and unit owners. The Highland Towers land was owned by AmBank (M) Bhd. However, when contacted by EdgeProp.my through email, the company said the land was sold “some years ago”. Ambank also declined to disclose more details on the deal including the transaction price and details of the new owner. As of early July, the ministry (which has set up a special taskforce on the Highland Towers redevelopment) has identified the landowner of Highland Towers — Regal Field Development Sdn Bhd. It has also managed to contact 111 out of a total of 138 owners of the condominium units. The 111 owners have agreed to the redevelopment as they have received full compensation for the collapse. At the same time, ministry secretary-general Datuk Mohammad Mentek, who has been appointed to chair the redevelopment committee, has had a meeting with Jabatan Insolvensi Malaysia. The latter has been given till July 16 to find out the names and contacts of the remaining 27 unit owners. He adds that before any development there can be explored, comprehensive studies need to be carried out on the site and its surrounding areas to ensure the engineering, soil condition, drainage, infrastructure capacity and other aspects are properly assessed to ensure its safety. “In addition, the process will also need to take into account the necessary compliance with the Selangor hillslope development guidelines,” he says. Will the market bite should there be any redevelopment in the future? Yew opines that a mixed development comprising high and medium-end residential landed stratified schemes such as villas, bungalows, semi-dees, and super-linked houses with gated-and-guarded schemes will be preferred by buyers. “Ulu Kelang is within the enclave of the KL urban city belt surrounded by elites, affluent residents and expat residents. The spill over effect from the rapid developments in KL, Ampang and Ulu Kelang areas has long been felt in this area. “But the Highland Towers collapse and several landslide incidents within the vicinity have resulted in a slowdown in developments and have pushed away developers from embarking on new developments here,” he opines. He notes that high-rise residential projects could be considered, if the development strictly complies with recommendations from experts with regards to building in the area. This story first appeared in the EdgeProp.my pullout on July 13, 2018. Download EdgeProp.my pullout here for free.